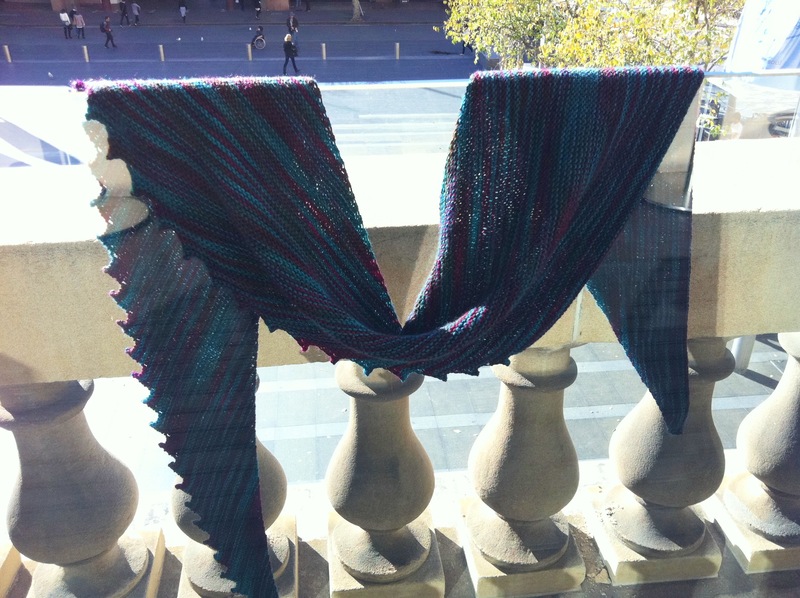 Earlier in the year there was an auction held on Ravelry as a flood relief fundraiser for those parts of Australia under water. I still recall the story of my mum’s cousin in Grantham, one of the epicentres of the Queensland floods, hanging in a tree for 5 hours unsure of his son’s fate when they’d both been washed out of their home and into the torrent of water that was the main street. Fortunately they both survived and lived to tell their amazing stories. I seem to recall around $9000 was raised from the 6 rounds of auctions on Ravelry for Wollmeise yarn. That might say just as much about the obsessive nature of Wollmeise fans as much as the Australian community spirit for doing what they can in a crisis, but hey, it was financial aid that counted. I was motivated enough to bid sufficiently for the skein of Wollmeise Twin (80/20, wool/nylon) in colourway “Guide to (the) Galaxy”. A pattern some weeks earlier had caught my eye, “Hitchhiker”. I’m sure you’ll agree, the two were kind of made for one another. And here’s the finished scarf, complete with 42 points, which is afterall, the answer to the question “What is the meaning of life, the universe and everything?”. 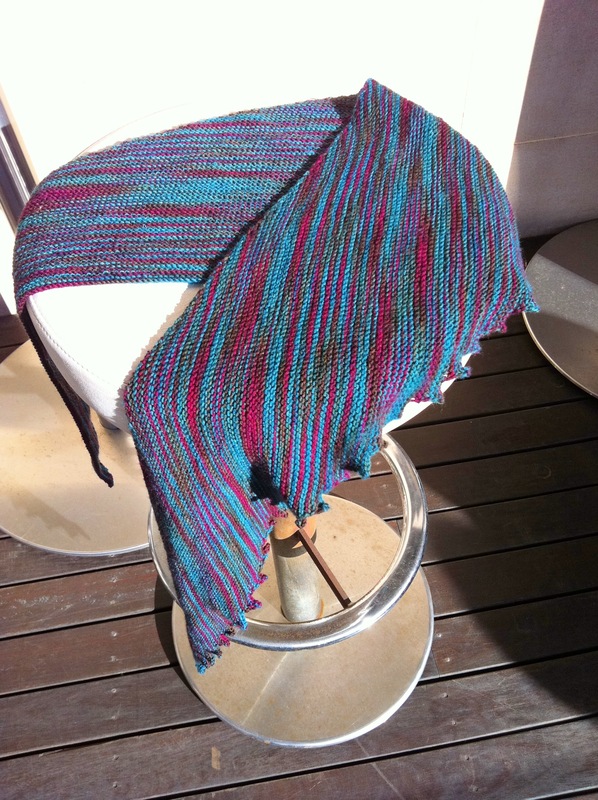 I needed to use 50cm of yarn from another skein of Wollmeise in the stash to complete the cast off. 3.00mm needles were used and I have pretty even tension, just in case you’re thinking of making one of these scarves from a varigated skein of yarn approx 467m. I highly recommend doing so! 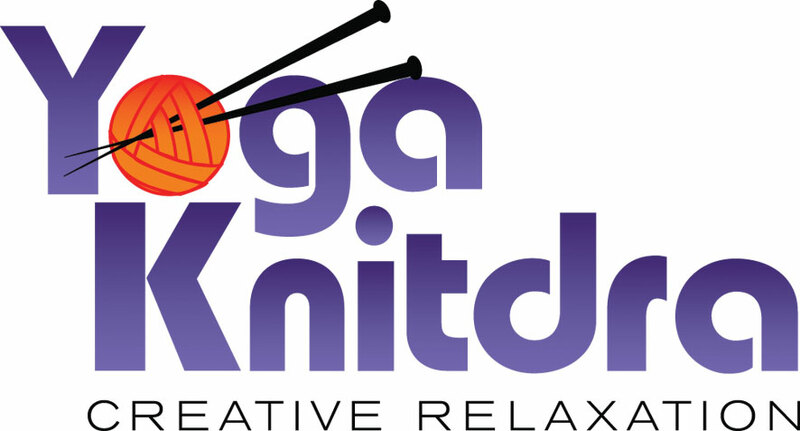 Yesterday I attended one of the World Wide Knit in Public (WWKIP) events that took place this week. It was lovely to soak up the sun hanging out the on balcony and the first real opportunity to photograph my Hitchhiker (complete with “Victorian Lace Today” book inspired shot over the glass panel!). I would have stayed out there more had I not been so keen to catch up with a few people I hadn’t seen in ages. Oh and of course fulfil my newly assigned duties as ‘tweet master’ of the prize draw ticket numbers. Did I tell you I won a prize? It was a great afternoon wasn’t it! Yay for sunshine and sandstone balconies! And yes, the yarn and pattern perfect for each other! I was admiring this so much from the balcony. What a great colour, and I didn’t know you’d bid on it at the QLD auction. Beautiful!